The Star reporter must be reprimanded for further inciting religious hatred. His job was to cover the event objectively. He may disagree with the protestors but he should report fairly and accurately. And he shouldn’t aggravate the situation to suit his grievance writes lawyer Lukman Sheriff Alias. There are four main ethical standards that all journalists should hold. One is seek truth and report it. 2) minimize harm 3) act independently 4) be accountable and transparent. Please Google US SPJ for example for elaborations. “Who gives you the right to claim this land as Muslims land? He was not professional and had thus provoked further the event. See http://www.freemalaysiatoday.com/…/reporter-saves-colleagu…/ to see the background. But this was probably after being provoked by the journalist himself. He was involved in the heat of the protest and carried this story with half truth. Third and most important, Star failed to recognize that this is a local planning issue. It’s similar to the cow head issue. It’s similar to objections over building mosques raised overseas which I’ve highlighted earlier. We need to recognize this as this will be a recurring theme and we need to delve deeper to resolve this. We don’t have to turn every local planning issue into a racial and religious headline. Crux to planning issue is the public or local consultation or consideration of the area. Establishing place of worship whether we like it or not is a sensitive issue not only here but worldwide. And these predicaments apply to all including the Muslims here. 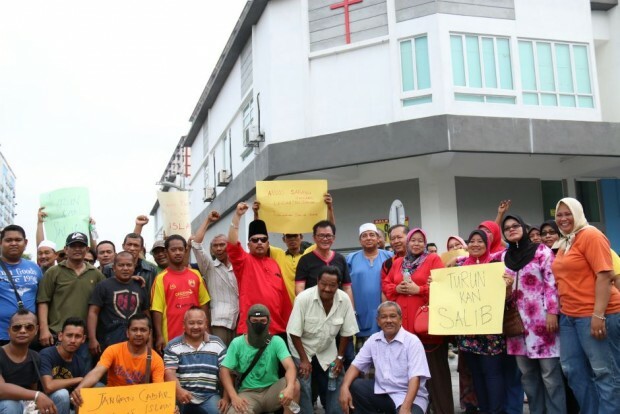 (See my previous posting where the Christians in Sabah objected to the building of a mosque in a Christian dominated area). There are many unresolved issues on this I admit but with proper public consultation it can be resolved. The Shah Alam cow head issue is an example. The temple was relocated just nearby and accepted by the residents after consultation. Back then I wrote it was due to the incompetence of Khalid Samad and I utterly condemned TMI when it initiated the issue as a pure bigoted religious issue. But this is an old story. Now our news media must be mindful and circumspect of local planning issues. Rather than focusing on the cause of objection, our news org especially AM have been sensationalizing any part of the protest, as racial and religious issues. They should carry a bit more research to find out whether local planning laws are followed. Present fairly and accurately views from both sides of the event. As a result of bad reporting, this Taman Medan incident is still highly unsatisfactory. The facts until now are still murky. Our papers including AM did not present a fair and proper account. And this is dividing us so deep. Going forward it will get worse. Theresa and Hannah recently issued a most farcical statement on this issue which will only lead to further problems. According to them establishing places of worship need not obtain any approval as its contrary to Article 11 of our constitution. This is wrong. One cannot build a place of worship anywhere one likes. Say one buys a commercial lot, one has a legitimate expectation that his next neighbour cannot be a place of worship. There are many issues like affecting customers and business confidence to inadequate facilities, eg, like congested car parks. I note the complaints of inadequate place of worship, but it is better resolved through the planning processes and consultations. And secondly, Article 11 does not say you have unbridled right to establish a place of worship ‘ikut suka hati’. The building of these places must be regulated. And this is constitutional. As a result of Selangor’s policies we will face further recurrent problems in the future. Let’s address this with wisdom and patience.